Sign the Declaration on Seed Freedom! Seed is the source of life and the first link in the food chain. Control over seed means a control over our lives, our food and our freedom. Corporations like Monsanto have created a seed emergency – an emergency through patents on seeds, seed monopolies, biopiracy, genetic engineering and creation of non -renewable sterile seeds. Seed monopolies have pushed 250,000 farmers to commit suicide in India. After contaminating farmer’s seeds and crops, Monsanto sues farmers “for stealing their gene”, putting the polluter pays principle on its head, and making it the polluter gets paid principle. The multidimensional emergency created by patents on seeds and GMOs needs a global collective response. Collectively, we must stop the patenting of seeds. Join the Global movement on Seed Freedom to stop the corporate hijack of seed and with it, the hijack of our freedom and our future. 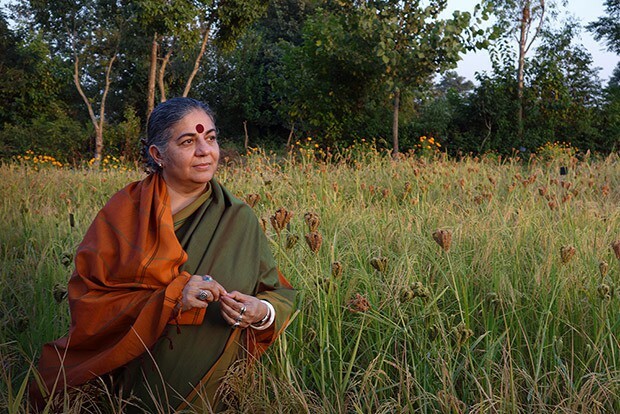 Read Dr. Shiva’s Declaration on Seed Freedom below and then click here to sign (scroll to the bottom of the page to sign the document and download a .pdf to send to freinds, colleagues and family! To this end, we will save seed. We will create community seed banks and seed libraries. We will not recognize any law that illegitimately makes seed the private property of corporations. We will stop the patents on seed.